If you like your crime fiction a little sleazy with plenty of questionable characters, Jason Latour has you covered with his new mini-series, Loose Ends. 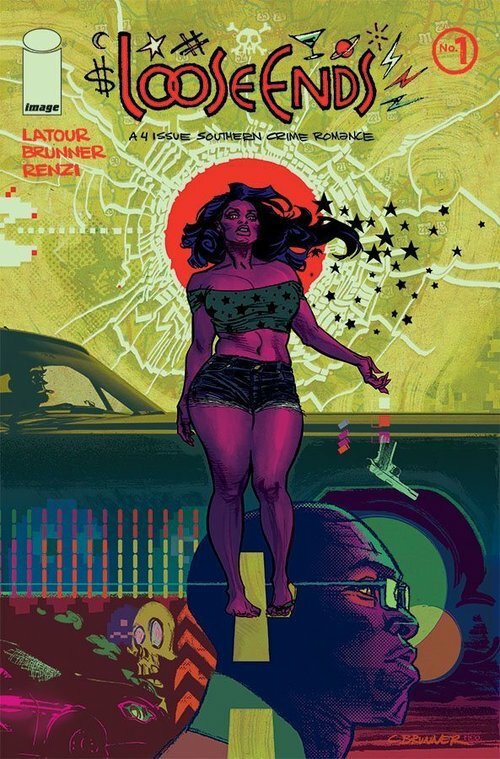 The artist of the southern fried and hard boiled 'Southern Bastards' series (with writer Jason Aaron), is off to a great start with an atmospheric and brutal story with help from artists Chris Brunner and Rico Renzi. Drug runner Sonny Gibson isn't all bad. His latest score affords him a minor celebration in the parking lot of a roadside dive. He's there to visit an old friend but as luck would have it, things go sideways fairly quickly. A vet whose time in the middle east was dangerous of course but there's more Latour alludes to that has some characters asking questions. As far as plot and action, little of it happens, culminating in a slow burn story that ramps up as it goes along. Regardless, 'Loose Ends' is riveting and enthralling. There's no clear "good guy," just folks that blur that line and that makes for some compelling drama. One aspect of the issue seemed predictable and almost exploitive but Latour swiftly turns the table on that situation. Now, I'm more invested than I expected. And you will too. Chris Brunner does a wonderful job with framing the story and laying out a smoothly paced story. He shares some of Latour's style but isn't shy to include plenty of detail, filling the page with a lot to visually chew on. Rico Renzi's warm colors only elevate the panels with bold hues that make Brunner's work pop and purr off the page. 'Loose Ends' is a gritty masterpiece that pulls you in. It captures the dark storytelling edge you've seen in things like Hell or High Water, Breaking Bad, Sons of Anarchy, and Justified. If you like 'Southern Bastards' you'll love 'Loose Ends.' Latour, Brunner, and Renzi bring you your next comic book obsession.